The following Smoked Rainbow Trout Niçoise recipe from Fishwives ~ A Cookbook by Goatsbridge was kindly submitted by Sally McKenna, food writer and publisher, who along with her partner John, is one of the best known figures in the Irish food world. We’re delighted to feature Sally’s recipe this month. It’s one of 78 you can find in our charitable cookbook, available from our online store. The pink pickled eggs must be made one week to a month in advance. The eggs will get more and more pink the longer you leave them. Place the peeled beetroot in a small pot with the water and bring to the boil. Simmer with the lid on until soft, about 30-40 minutes. Strain, reserving the cooking water. In a large glass jar, combine 140 mls of the beetroot water with the vinegar and onion. Add the dill, the cooked beetroots and the whole boiled and peeled eggs. Cover and refrigerate. Leave for approximately one week to a month. 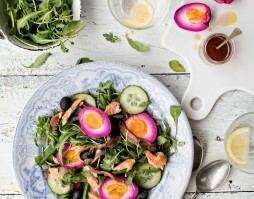 To compose the salad, arrange the lettuce, cherry tomatoes, cucumber, green beans, herbs and spring onion in a pretty bowl, finishing with the eggs, olives, anchovies, and finally the trout. Combine ingredients bar dressing and pour over.